Yes, you read that right. The multiplex theater attached to the ultra-uber-iconic landmark theater, formerly known as Grauman’s Chinese Theater and Mann’s Chinese Theater, is now serving the most adult of adult beverages in its lobby. Appropriately enough, the cocktails on offer were named for films screening this year at TCM Fest. Of the Bonnie and Clyde, the Funny Girl, and the On the Waterfront, I selected the first because it’s by far my favorite of the three movies. Maybe it’s my preference for the first’s film French New Wave inspired style, maybe it’s my queasiness about the some of the sublimated HUAC-friendly politics of “On the Waterfront,” or the fact that “Funny Girl” proved that master of all genres directorial genius William Wyler was somewhat defeated by musical comedy. Or maybe I just like blackberries. 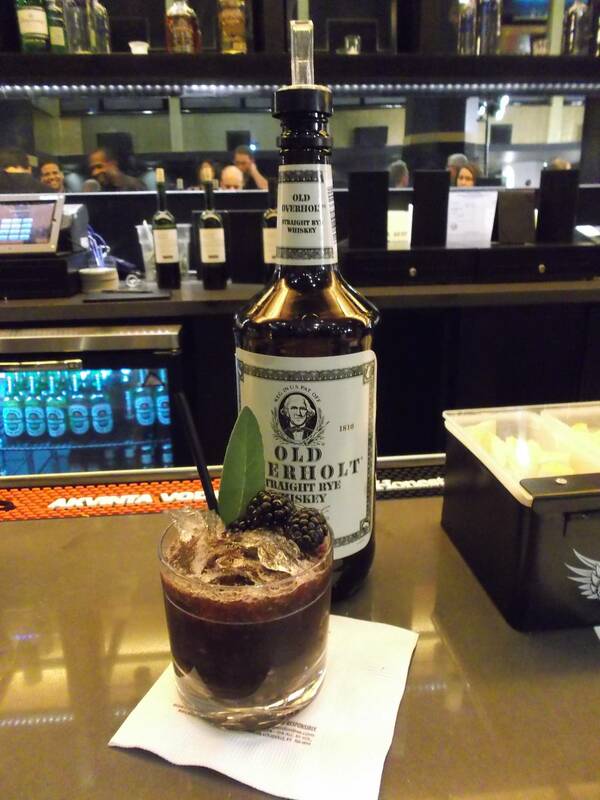 I can’t say that it’s quite my favorite of cocktail of this batch, but this melange of fresh blackberries, sage, and the ever more ubiquitous Old Overholt Rye Whiskey was very nice. If you’re looking for more movie connections, this whiskey was supposedly the favorite of Doc Holliday, played by Kirk Douglas, Victor Mature, Jason Robards, and Val Kilmer to name just a few. Located near the corner of Hollywood and Vine next to the Pantages Theater, Bob’s Frolic is probably the Musso’s of L.A. dive bars in terms of reputation, ambiance and iconography. It’s certainly been featured in enough movies, most famously “L.A. Confidential.” The quality of the drinks is, well, just fine for a dive. 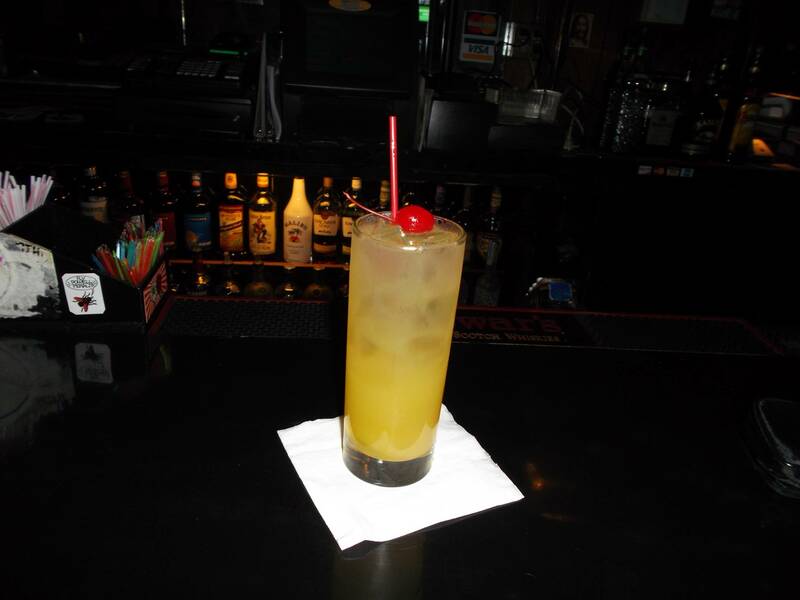 In fact, I’m here to tell you that this Harvey Wallbanger — vodka, orange juice, and Galliano liqueur — is perfectly okay. Being in the Frolic, is kind of extra special, though. If dive bar offerings just won’t do, then serious drinkers should venture across the street from the Frolic to Wood and Vine. The gang here is trying to do some interesting things with their mixology and I can’t help but be a bit taken with the place. This here colorful beverage is named for the fictitious berry marketed by one Willy Wonka. I was there latish at night one cool night just as the festival was finally ending, but this rather tart concoction would be just the thing on a hot late September Hollywood afternoon. 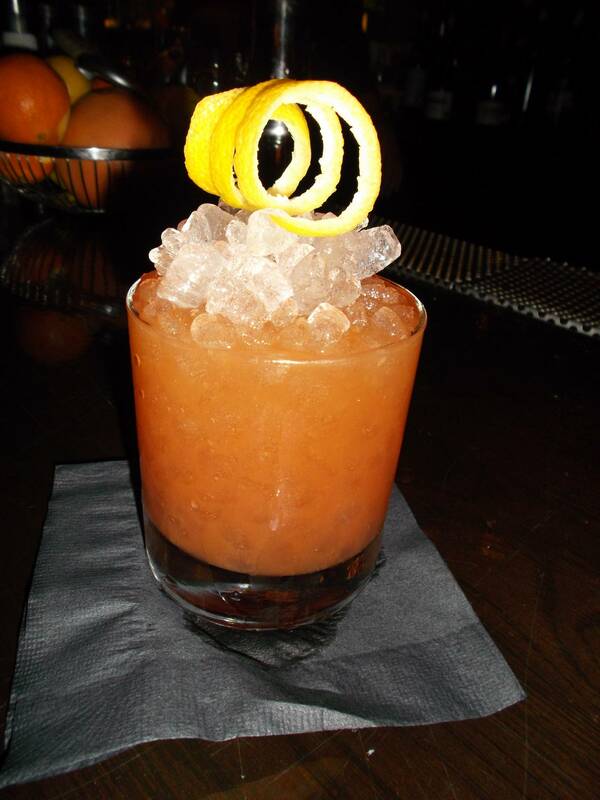 It contains pecan-infused dark rum, lemon juice, sherry, strawberry-rhubarb syrup and cinnamon bitters, but it’s the rhubarb that dominates. Garrison Keeler would approve and so did I. Even serious boozers need to eat sometimes, and more and more places around Los Angeles are infusing the craze for gourmet burgers with mixology. 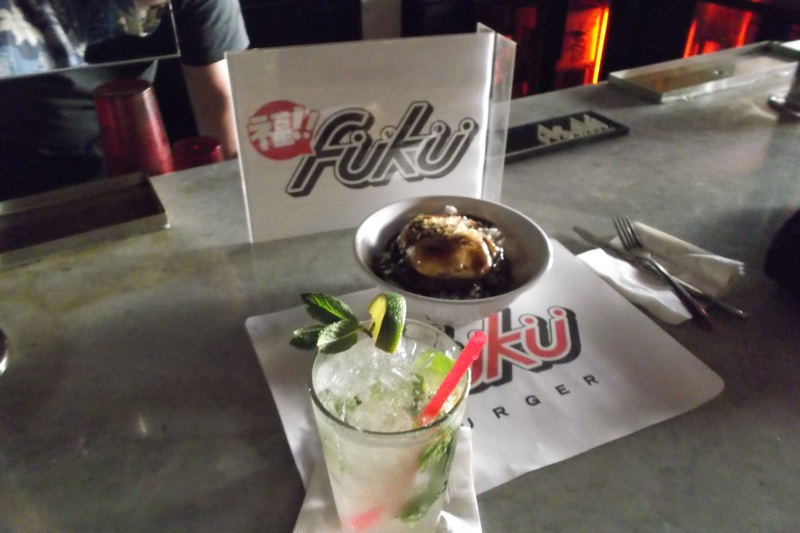 Located a literal stone’s throw from Hollywood Blvd, Fukuburger is technically located on Cahuenga and they don’t even have a full bar. But I’m a fan of their Asian-influenced approach to burgers and this combination of Ichishima Silk Sake, fresh mint, and a hint of Sprite…yeah, Sprite…is actually a very tasty way to wash down a Fukuburger offering. In this case, a concoction of burger, rice, egg, brown gravy and bonito flakes. It was good enough in its mixture of traditionally Japanese and American ingredients to make me wish TCM Fest featured one or more Japanese Yakuza movies — say, Seijun Suzuki’s “Branded to Kill.” Maybe next year.